The paper also had a finalist nomination for “Best long-form feature”, Zeddy Lawrence, “Lest We Forget: Centenary of Anzac”. The newspaper continues to provide high-quality, professional journalism to the Jewish communities around Australia, with an extraordinarily high rate of readership in the Australian Jewish community. For those of us who care about newspapers and the business of journalism – or, shall I say, the reporting of news, because the word “newspaper” seems soon to be outmoded – the news is mixed. I must be a child of another age. I love opening my copy of The Sydney Morning Herald every morning and scanning the pages. I don’t particularly like the new “tabloid” format, but I better get used to it: the “paper” version of the “paper” is likely to get even thinner. And when will the “paper” disappear entirely? Well, the news from New York City is not all bad for those of us who believe in quality commercial media organisations. Ken Doctor (neat name, huh?) reports that The New York Times actually GAINED 0.3 percent of revenue in 2012, the first time that revenue grew in six years. At least there’s some good news for The Times. The also paper sold its ownership of The Boston Globe this past week. For US$70million. Fair enough. Except that The Times paid US$1.1billion for it in 1993. All of this sounds good. I guess. Will The Times avoid the fate of The Oregonian (and countless other American papers), which in June announced that it would drop its printed publication to only four days per week. In other words, The New York Times appears to have stopped the drift and – primarily through strong cost-cutting – seems headed towards profitability (of a sort) again. But if newspapers are increasingly being delivered digitally, what do we call them, if “paper” is no longer the right word? Yesterday (Friday 2 March 2012) the Australian Independent Media Inquiry – headed by retired Federal Court Judge Ray Finkelstein – issued its report. And what a “doozy” it is. – The effectiveness of the current media codes of practice in Australia, particularly in light of technological change that is leading to the migration of print media to digital and online platforms. – The impact of this technological change on the business model that has supported the investment by traditional media organisations in quality journalism and the production of news, and how such activities can be supported, and diversity enhanced, in the changed media environment. – Ways of substantially strengthening the independence and effectiveness of the Australian Press Council, including in relation to online publications, and with particular reference to the handling of complaints. – Any related issues pertaining to the ability of the media to operate according to regulations and codes of practice, and in the public interest. The result is a philosophical, “folksy”, easy to read and quite comprehensive snapshot of where the Australian press is today – and particularly examining the issues of freedom of the press, media business models and regulation. It is not every report to the Minister that quotes Thomas Macaulay, John Stuart Mills’ On Liberty (1859), John Milton’s Areopagitica (1644), US Supreme Court cases from 1951, Canadian Supreme Court cases from 1957, radical thinker Cass R Sunstein’s Democracy and the Problem of Free Speech (1995), Jurgen Habermas’ The Postnational Constellation (2001) and US Supreme Court Justice Potter Stewart – and that’s only in part of chapter two (“The Democratic Indispensability of a Free Press”). I was particularly interested in chapter three “Newspaper Industry Structure and Performance”, about which I will write more in detail in a later post. While the report is lengthy there is a summary which sets out my recommendations together with a synopsis of my reasons. The report proper contains a detailed analysis of the issues I thought ought to be addressed. There is nothing I can usefully add to that analysis. Having completed my task, it is appropriate for me to await any discussion about the report’s contents, rather than to pre-empt that discussion. I do not think it fair to speak to individual members of the media lest it be thought I am showing preference to some over others. I don’t think the media is thrilled by this, because they thrive on personalities and conflict and extravagant statements. This Finkelstein declines to do. Good on him – although I suspect he will continue to be in a minority in this regard. 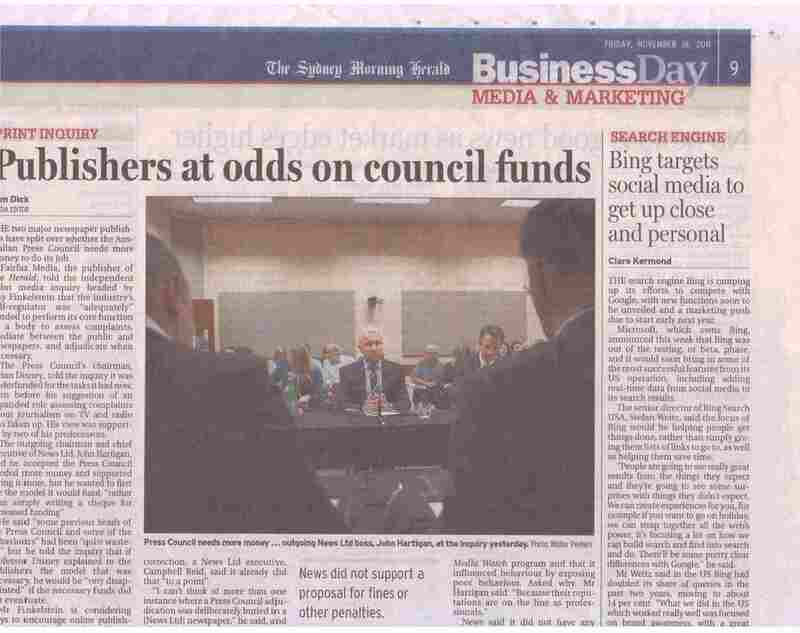 Here is a link to the The Sydney Morning Herald article (page 3, Saturday 3 March 2012) about the inquiry’s report, which is entitled “Fears of media showdown if new watchdog wins approval”. The greatest worry expressed in the article is that the key recommendation – to set up a government-funded “News Media Council” (replacing the voluntary industry regulation through the Australian Press Council) – “would be tantamount to government regulation”. I am not so certain about this, partly because it seems to be universally acknowledged that the Australian Press Council is not fully functioning as it needs to (at least that was the sense in the hearing I attended). So far, the reaction has been News Ltd, Western Australian Newspapers and the Institute of Public Affairs all do not like it, the Greens party does and Fairfax Media (publishers of the Herald) were “still digesting” the report. I am not so worried about the “government regulation” problem, although this would necessitate some changes to the Australian Communications and Media Authority (ACMA), the current regulator of many broadcast and advertising activities. Let’s see how this one plays out in the coming weeks and months.